We offer a full range of property management services tailored to you as an investor, homeowner, or landlord. We have an extensive portfolio of single family homes, townhouses and condos in the Sacramento area. Some of the many benefits of trusting KTB with your Sacramento Property Management needs are detailed below. KTB Property Management has leased over 3,000 houses in their 20 plus years of Property Management. We currently lease 10 to 15 homes a month; some using or Full Management Services and others with just the Rent-up Option. Our market place is the entire greater Sacramento region including Placer, and El Dorado counties. Here is an overview of the steps we take to market and lease your property. For the do-it-yourself investor, looking for maximum marketing exposure for the dollar, KTB Property Management will list your property in our marketing program, screen the callers, get an application (and credit report) and pass them on to you. The property can be anywhere in greater Sacramento; our marketing program covers Sacramento, Placer, Yolo and El Dorado counties. The City of Sacramento, home of the state’s capital building, is rich with diverse neighborhoods with a variety of lifestyle choices. From downtown living to suburban life, the City has much to offer. Sacramento also has a Neighborhood Services division dedicated to bridging and engaging residents with resources and creating collaboration opportunities among neighborhood groups, city officials, departments and other stakeholders. As the sixth largest city in California, the city of Sacramento was also named “America’s Most Diverse City” by TIME magazine in 2002. The City is home to an excellent education system, from K-12 schools to universities. California State University, Sacramento, commonly known as Sac State is the largest university in the city and one of 23 campuses in the California State University System. Drexel University Sacramento and the University of the Pacific McGeorge School of Law are also centrally located in the city. 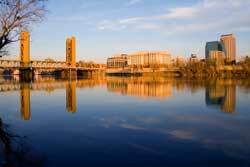 Additionally, The UC David Medical Center, a world-renowned research hospital, is located in the city of Sacramento. Fifteen miles away is the University of California, Davis. In 2007, The Art Institute of California, Sacramento was established and is focused on educating students in the field of commercial arts. The Universal Technical Institute (UTI) offers automotive programs in auto mechanical, auto body, and diesel. 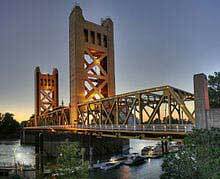 One of the most iconic features of Sacramento is the Tower Bridge, a pedestrian, bicycle and vehicular traffic bridge that connects Sacramento and West Sacramento. Sacramento is also known as having the fourth most largest public transportation system in the state of California. The city and its suburbs are served by Sacramento Regional Transit District, which is ranked as the ninth busiest in the Unites States. Also iconic, is Sutter’s Fort, located at the intersection of 27th and L. Originally begun in 1839, Sutter’s Fort was the first non-indigenous community in the California Central Valley. When gold was discovered at Sutter’s Mill, the fort was abandoned and has since been restored to its original condition and it now administered by California Department of Parks and Recreation. In 1961, it was designated a National Historic Landmark. The city of Sacramento has a variety of events, activities and entertainment, as well as a large performing arts community. There are several major theatre venues for Sacramento. The Sacramento Convention Center Complex governs both the Community Center Theatre, where The Sacramento Ballet, Sacramento Philharmonic Orchestra and the Sacramento Opera perform. The complex also governs the Memorial Auditorium. The Wells Fargo Pavilion is home to Sacramento’s oldest theatre organization, The Sacramento Theatre Company and is one of the smallest theatre venues in the area. Professional theatre is represented in Sacramento by a number of companies including California Musical Theatre, Music Circus, and The Sacramento Theatre Company. During the summer months, William Land Park holds The Sacramento Shakespeare Festival to provide entertainment under the stars. Established in 1977, The Sacramento Metropolitan Arts Commission provides several arts programs for the city. These include Art in Public Places, Arts Education, Grants and Cultural Programs, Poet Laureate Program, Arts Stabilization Programs and other resources and opportunities. Sacramento Second Saturday Art Walk is a program of local art galleries that stay open into the late evenings, providing a unique experience for the local population as well as tourists to view original art and meet the artists themselves. 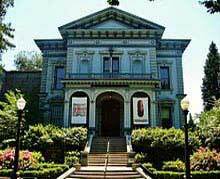 Sacramento also houses The Crocker Art Museum, the oldest public art museum west of the Mississippi River. Other museums in Sacramento include The California State Railroad Museum in Old Sacramento and The California Automobile Museum, located just south of Old Sacramento. Annually, Sacramento hosts Museum Day, in which 26 museums in the greater Sacramento area offer free admission. In 2012, Sacramento started the marketing campaign as “America’s Farm-To-Fork Capital” due to Sacramento’s many restaurants that source their food locally from the numerous surrounding farms. Their mission is to communicate a regional identity that celebrates the local sustainability and food production of the Sacramento region by featuring the farmers, chefs and culinary community that make the Sacramento region the Farm-to-Fork Capital of America. Sacramento is also known for its beverage culture, with keystone events that include Cal Expo’s Grape and Gourmet, Sacramento Beer Week, and Sacramento Cocktail Week. Sacramento is home to one major league sports team – the Sacramento Kings of the National Basketball Association. In October of 2014, ground broke to build a new arena, which will open in 2016. 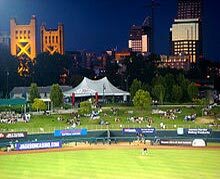 The city is also home to the Sacramento River Cats, a AAA minor league baseball team as well as an affiliate of the San Francisco Giants, and the Sacramento Republic FC, an American professional soccer team. The city of Sacramento has an extensive park system consisting of over 5,000 acres of parkland and recreation centers. American River Parkway is a 23-mile parkway that runs along the American River consisting of many smaller parks and boat launching points. William Land Park has many different attractions including The Sacramento Zoo, Fairytale Town, Funderland and The William Land Golf Course.